Peta put together a great workshop featuring tools and techniques to handle difficult conversations. An important lesson is to structure your project game plan around having the conversations before it’s too late. As a lot of difficult conversations with clients can arise from not managing expectations early on in the project. For me the pull technique of asking open questions to draw the person into the conversation was very helpful. For example, how do you think the project is going? Can you talk me through the plan in some more detail? This allows the person to tell you whats’ going on and potentially identify where there is an issue, without you having to raise it. Go into a conversation with what you want the outcome to be, and steer it in the direction you want it to go in. One last top tip is to use a physical object to minimise confrontation e.g. stats or figures, as this then focuses the conversation around the other thing rather than an awkward conversation between two people. The afternoon workshop track I chose looked at Agile inception and was delivered by Kevin Murray from Valtec. This was a fantastic practical workshop of agile inception activities that Valtech deliver to a range of diverse stakeholder groups. The standout activity for me was ‘Sliders’ as it was such a simple, yet highly effective concept to manage stakeholder expectations. In essence it’s a simple sense check to ensure the client doesn’t want the moon on a stick. 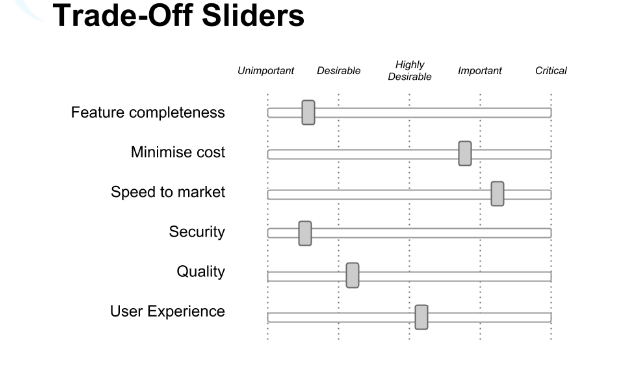 The stakeholders have to move the sliders up or down to reflect the appropriate mix of factors that will determine project success. Using a points scale helps clients to realise that if you have 11 points per factor and 100 points to be divided over say 10 key factors it quickly shows that it’s not possible to have something quick, cheap and high quality. Any project inception can benefit from this simple yet effective exercise to ensure everyone is on the same page. Lawrence kicked off the conference with a great talk on how you start off a project. Taking the time to cover of these early gets everyone on board and helped the project to run much smoother. One other handy tip was at the start the team had to write out 5 bullet points on what they thought each person’s role was going to be on the project. This also helped to clarify roles and responsibilities early on. Liz Calders talke was a great reminder that projects by their very nature imply change. She shared her experience of coming across project saboteurs who were derailing projects and causing havoc to timelines and deliverables. Though the key takeaway here is that often a saboteur is causing project damage due to the nature of the change. So as a PM it’s also important for us to help stakeholders understand and manage the change. Simply explaining to certain stakeholders where their skills and experience add value to the work of the team can help get people back on board. Rebecca gave a fantastic and courageous talk about imposter syndrome within the PM community. Imposter syndrome is the inability to internalise accomplishments and is a fear of being exposed as a fraud. Astonishingly around 70% of successful people have experienced the feelings associated with IS. For me this talk really showed how important it is for the digital community to talk about failure more and not to be ashamed to share our failures rather than just our successes. In essence we all need to sack off the comparisons, as after all we don’t paint our securities on our outside. The more we’re open and honest about failure the less people will feel that they’re not good enough and hopefully reduce the feelings associated with IS. Saniha shared her experiences of starting out in the industry and how daunting it is to get to grips with all the digital lingo. She was super proactive in speaking with developers and designers to ask them to explain the array of mind boggling acronyms to help her communicate better with clients and the team. Her simple idea of a minimal viable glossary within teams can help improve communication and of course avoid misunderstandings. Suze gave another cracking talk, this time she delved into the minefield that is estimation. A really obvious thread from this talk is that estimation is really tough, there’s no silver bullet to getting it right. As after all estimation is like forecasting the weather there can always be a change in the wind which throws even the perfect estimate out the window. One simple take away from Suze’s talk was doing a project premortem, take a bit of time at the start of a project to think about why it might not work out, what other risks or issues have you not considered? And of course as humans we’re not so good at thinking about the worst case scenario so if you can always add that extra bit of contingency wherever you can. The last talk of the day was from Carson. His talk focussed on the science of the brain and what our brains need to perform at their best. We can be guilty of thinking that our brain is some sort of super computer. As PMs we can quickly burn ourselves out and we don’t often acknowledge that our brain suffers from decision fatigue, in that our ability to make decisions gets worse throughout the day. Carson had a few simple tips we all know but often forget, which will help look after our brain and therefore improve our mental performance. > plan – schedule your day around how your brain works, for example first thing in the morning and after lunch is when our brain is more focused. So as always I have come away with new ideas and tools to apply to my day to day work.